The Irish Times uses that expression in their headline, but don't attribute it to any particular person in the story. In any case, the image you see is most definitely not a bikini, but more like something you might see on a 19th century postcard. It has Ireland all riled up. University College Cork (Ireland) is sponsoring an art exhibit titled “Our Lady and Other Queer Santas.” The exhibit features the work of Mexican artist Alma Lopez, and is sponsored by the university's Mexican studies department. The Bishop of Cork and Ross has termed the exhibit "offensive," particularly this digital image of Our Lady of Guadalupe wearing a floral outfit. "This group is inciting some Irish Catholics to denounce me as a blasphemer. "My response to them, to those Irish Catholics who think my intention was to slam the Catholic faith or insult their beliefs, and to the Bishop of Cork and Ross, Most Reverend Dr John Buckley, is that I am not portraying the Mother of God, and I don’t consider women’s bodies offensive, crude, or impure. "I love women, just as I love the Virgin of Guadalupe. Our Lady was my way of communicating my love and respect for all women, including the Holy Mother." “The artist has refuted any intention to offend, pointing out that she has publicly stated both in published work and on her website that her intention was to portray a strong ‘Chicana’ in a place of honour and respect that she deserves,” the spokesman said. The Times reports that the artist wanted to examine "the expression of devotion through the mixing of traditional and high-tech materials" and said Lopez described her own work as “offering a modern take on venerated figures like the Virgin of Guadalupe." Lopez's work has seen controversy before. She exhibited the same work at the Museum of Folk Art in Santa Fe, NM in 2001. It was criticized by Santa Fe's Archbishop Michael Sheehan. Sheehan even led protests against the Museum. Lopez says she was subjected to physical threats during this time, and points out that, when you stop and think about it, the Archbishop was fussing about what she called "only an image of a forty year old woman with her belly and legs exposed standing on a black crescent moon held by a bare breasted female butterfly angel. This small print was on exhibition in a museum, not a church." The Irish bishop argues that an "inclusive society" should have respect for the "religious iconography of its citizens," which is a good point and well-phrased. One could argue that Alma Lopez has done so. As she notes, she grew up with Our Lady of Guadalupe, the central icon of her culture. I admit, I was surprised by the violent reaction to Our Lady because I am a community artist born in Mexico and raised in California with the Virgen as a constant in my home and my community. I am know that there is nothing wrong with this image which was inspired by the experiences of many Chicanas and their complex relationship to La Virgen de Guadalupe. 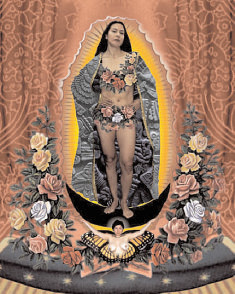 I am not the first Chicana to reinterpret the image with a feminist perspective, and I'm positive I won't be the last. Lopez has a book coming out describing her Santa Fe experience. It is titled "Our Lady of Controversy: Alma Lopez' Irreverent Apparition." It's probably too far along in publication to include a chapter on Ireland, and the (mis-named) "Our Lady in bikini" controversy.